Words by Kevin Doocey on December 11, 2009 . Top of the table, seven points clear and a bunch of players that want success for this club, and no, I’m not talking about BSC Young Boys in the Super League in Switzerland. 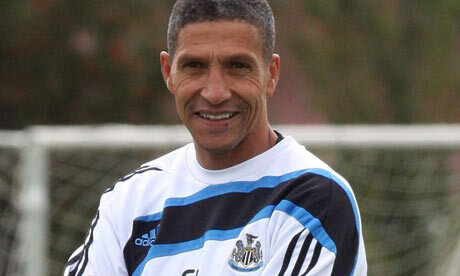 Newcastle are doing well and a man by the name of Chris Hughton is doing his job very well indeed. When Hughton’s name was mentioned with the permanent role as manager, a lot of people would’ve rather to have had Ruud Gullit back than Chris, but how that has changed. I myself wasn’t keen on seeing Chris as first team manager but after pre-season and friendlies in the Summer, my opinion changed drastically. Mainly because he was getting the best out of the players, there was a sense of safety within the camp even throughout the period in which Mike Ashley tried to sell the club. Most importantly, he’s running first team matters professionally and this is absolutely vital in any football club that wants to go places. Being top of the table is also an achievement that Chris should be proud of, not to mention the various accolades he’s collected since the start of the season. If the players and indeed the staff can keep up there good form of late then we can be satisfied for once. All in all, the players, mainly on huge wages, owe this club big time. Promotion would be the first step. Really? Chris Hughton is an absolutely hopeless manager. There have been many games where we have been absolutely rubbish, but we've been very lucky and not been punished by poor teams in a poor league. The substitutions he makes are an absolute joke. Ok we are doing well in the league, but so we should - in comparison to the other teams, we have huge resources i.e. high profile players that cost fortunes and are paid fortunes that the other teams just can't compete with. Hughton is just a “yes man” puppet manager, with Ashley and Llambias pulling his strings, and this is the only reason he was given the job on a permanent basis. If we get promoted, we'll be the premiership whipping boys unless we can attract some top players to the club - but which top player is going to want to come and play for Chris Hughton? Yeah, surprising how a run of wins will soothe the savage beast, that can be the average NUFC fan. The present situation has the fans in a good frame of mind and past prejudices against Houghton (cockney- ex Spurs, MA yes man) seem to have been put aside. However we are all well aware you are only as good as your last game and following a couple of losses the old animosities would soon surface. I couldn't care less if we've been hopeless in some matches this season - we've won the last 7 on the trot - and won 5 of our 6 games in August to get off to a great start for the season. And we have won most of those games through grit and determination - something we didn't have too much of last season. If this had been Alan Shearer he would have been the greatest manager since Kevin Keegan and Bobby Robson. 7 wins on the trot and we still have people complaining - but I guess that's life - they'll still be complaining if we win 15 on the trot - but maybe they are the same ones who forecast relegation this season. My tip to Newcastle fans - be happy - we are winning - and it's a lot better than losing. Give him a slack, though we are not playing Keegan Style, we have the best defence in the country. That is a change which is might take us some time to get used to, but it's a nice one. The players support him and so should we, though we all wished Shearer was the manager. Neill, your comments are a disgrace. Hughton assessed the situation well and has worked within his means to put together a side that won't give much away because he knows that in the Championship teams need 5 or 6 chances to score 1 most of the time, whereas we only need 1 or 2 to score. We are premiership quality and we are playing to our strengths. It's all too easy to say, "this team is too good for this league, he is still a rubbish manager". You don't have to delve to deep into history to see good squads playing poorly and losing to teams far inferior to them...In fact, you only have to look at us over the last few years. As Ed Harrison said, Hughton will never get the credit he deserves and never get the full backing of the Toon Army. For this reason i hope he gets us up, is sacked unfairly, hired to manage a team with fans who have patience, and then goes on to prove every critic wrong. Make no mistake, i do not see Hughton as the black Lippi, but he has got a bunch of misfits together and turned them from a thoroughly in-balanced side into a hard working, hard to beat side full of confidence. Now we just need to compliment and suppliment our squad with a few silky, classy players (maybe 3 or 4) and we will have a squad superior to half of the teams currently in the prem. Like most fans Chris was not my first choice in the top job (no problem with him being no 2). That was due to a feared lack of experience no other reason (like was not born in Newcastle or any other illogical or worse motives). However, I was also one of those who saw us "doing a Leeds". Yet despite Mike Ashley continuing to be a disruptive influence we are top of the league and look to have a real chance of getting back where we belong. Credit where credit is due he has done everything the fans could of asked of him. As for the suggestion he won't attract big names. I'd like to think the days of attracting big names for one last big pay day are over. We will be better off signing talented young players who have the right motivation. Dragonera - I'm afraid I don't agree that we are "premiership quality". We’re doing well because we rely on individual quality – a great finish here from one of the front men, or a great save there from Harper. On the balance of play over 90 minutes, we rarely dominate teams (a couple of games excepted) even though they are mediocre teams working on significantly inferior resources to us. But with that said, I accept that the season is 46 games so there are bound to be some blips along the way. Our great defensive record is not because Hughton has turned us into a really well-organised outfit – its because strikers in the Championship aren’t Premiership quality and we have a good keeper! We still leak maybe 4 or 5 chances per game, which in the Premiership means 2 or 3 goals conceded. We have a quality squad by Championship standards, but a fairly poor one by Premiership standards. It is possible for such a team to win promotion and then do OK in the Premiership without massive investment (I’m assuming Ashley won’t be spending much on players), for example like Stoke have recently done. But this can only be achieved by being really well-organised and difficult to beat. We might seem to be both of those things right now in the Championship, but put us up against Premiership opposition week in week out and I suspect that you’ll find that Hughton hasn’t got us all that well organised, and being totally honest, we’re not playing all that well. That being the case, I think we’ll get murdered next season if Hughton is in charge. I too hope he is sacked and we get someone with a proper pedigree as a successful and credible manager. Ok, we’re sitting pretty at the top of the league right now, and we’re all very happy about that, but our performances are hardly setting the world alight so lets not get carried away. Taunton Toon Can you be a bit more explicit in your accusation of Ashley being a disruptive influence.? Neil Tend to agree, too good for the second tier (where we will still probably lose a few) and not good enough for the PL. However with as few as perhaps four or five decent signings we could be competitive, not as a top tier team but as survivors. And it`s easier to progress as a PL team over time, due to the funds earned there as opposed to the second tier, making it important to earn promotion at the first attempt.